Death-Defying Heart-Stopping Leap of Faith. With Blood. After I thought this post all the way through by explaining it to Best Beloved I discovered that the scene I was thinking of doesn’t exist in the movie. But it must have happened, so I’m going to write as if it did. Let’s all suspend disbelief for a few , eh? Short synopsis of some core concepts: Kate’s friend Stuart has discovered holes in time. He accidentally brings Leopold back from the 19th century. Kate and Leopold fall in love (you didn’t see that coming, did you?) and after Stuart sends Leopold back in time, they realize Kate must follow him. 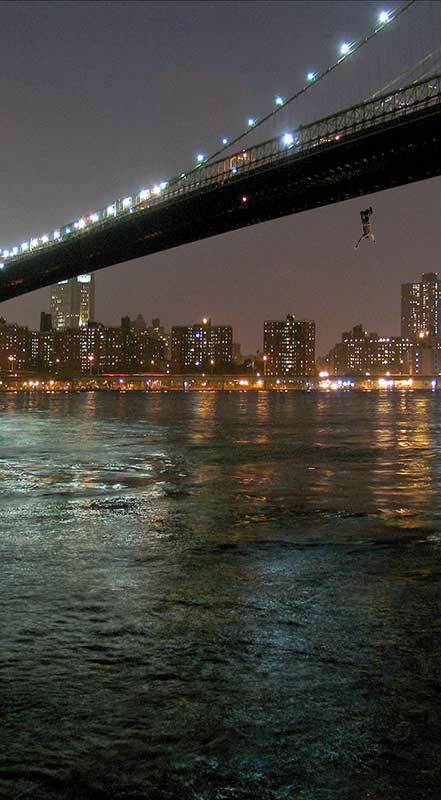 Thing is, to do so, she must leap off the Brooklyn Bridge at precisely the right time and fall through a portal which will appear below her feet. No portal, and she won’t have to worry about the freezing waters below; the fall will kill her. So picture this with me, eh? A tiny little woman crosses a girder above the lower level of traffic on the Brooklyn Bridge. Stuart is cheering her on, but it’s 10″ wide and there’s wind blowing, traffic below. Falling is almost certainly dying. Now comes the good part: precisely at the moment the nearby clock tower strikes, she has to jump. Because there’s no visual representation of the portal. Until she hits it. Then, it appears. So there you are, because imagining someone else doing it is easy, there you are, having just scared yourself half to death doing a high-wire walk over speeding traffic 20 feet below, and now, you’re looking down into the dark. Way down there, there’s something. A river. Icy. Freezing. And, from this height, like hitting concrete. Feel the wind gusting and knocking you off balance. Spread your feet to keep your balance, and look down again. It’s not going to magically appear to give you something tangible to aim at. All you have is the word of a trusted friend that if you leap, it will appear. And you only have so long. The clock bell continues chiming. When eleven rings and fades, you’re too late. In your imagination, did you leap? Did you jump into nothing, believing, mostly, that you’d survive? How’s your heart rate right now? Palms sweaty? Back of your neck tingly? If it was real, you wouldn’t have jumped. I know I wouldn’t. We’d be so terrified we’d stand there crying, terrified to jump, knowing we had to, but just too gut-wrenching mortified to take the leap. Every time I walk down those stairs right there beside me and close the door of my writing office, it feels like you imagined the feeling of standing in the dark and wind looking down at death. Because until I go sit down and put my fingers on the keyboard, the portal to my words doesn’t appear. There have been days when, instead, I lay on my bed in tears. That’s not metaphor, it’s embarrassing reality. There have been days when the terror of spilling the blood it takes to write something worthy overwhelms me, and I can’t make myself do it. So when you read one of my books, keep this in the back of your mind. Look for the bloodstains on the pages. Joel, I do enjoy when you let Edgar Allen Poe take over your body. You can probably remain this way until Halloween, but take a cold shower after that. I’ve seen your blood on many pages, my good man. You know the drill.